UPTOWN — The year 2014 was an eventful one in Uptown and Andersonville — and DNAinfo Chicago was there for the ride. One iconic Andersonville landmark was removed and will be replaced by a replica, while another neighborhood staple changed ownership but will remain mostly the same. Below are some of the most notable moments of the year. 1. 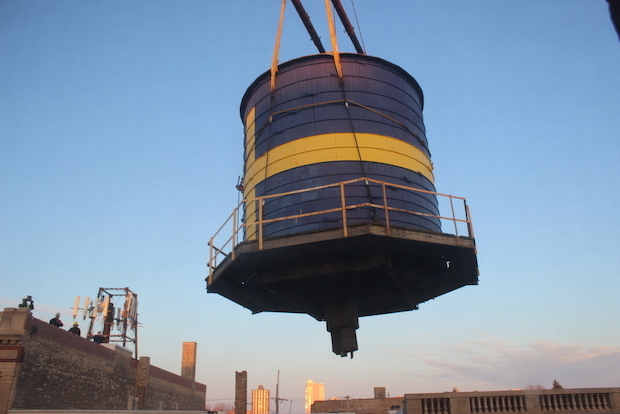 Landmark Water Tower Comes Down — Andersonville’s iconic water tower, painted to look like a Swedish flag, was removed from its perch atop the Swedish American Museum in late March after the harsh winter caused irreparable damage. In mid-November, the museum announced it would replace the 90-year-old landmark — which has been in the museum’s parking lot at Foster and Ashland since March — with a replica that will not be a functioning water tower. The museum has raised more than $70,000 of its $150,000 fundraising goal. 2. Women and Children First Changes Hands — Women and Children First, Andersonville's beloved feminist bookstore, was put up for sale in 2013 and sold this year. Original owners Linda Bubon and Ann Christopherson passed the torch to employees Lynn Mooney and Sarah Hollenbeck. The new owners will continue operating the independent bookstore with a feminist focus, just as it has been since in opened in 1979. In October, local leaders came together to designate the corner of Farragut Avenue and Clark Street as “Honorary Women and Children First Way” to commemorate the store’s contributions to the neighborhood. 4. A Little Bit of European Flair Coming to Argyle — After more than a year of planning, officials showed off the finalized design for the much-anticipated Argyle Streetscape in September. 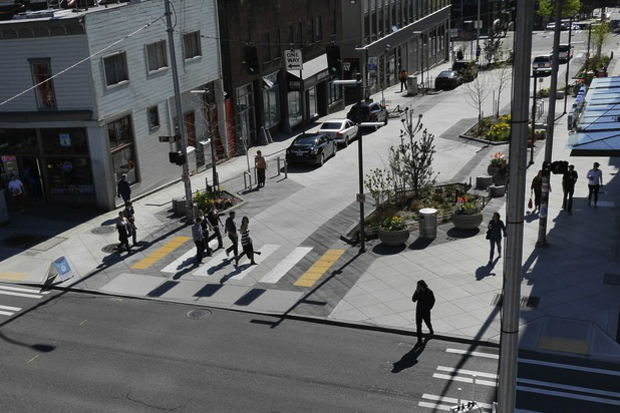 The European-style “shared street” plan blurs the line between street and sidewalk by raising the street and cutting curbs while slowing traffic to create a plaza-like feel. The project is expected to cost $3 million and will begin in 2015. 5. Wilson Red Line Makeover Begins — Construction on the more-than-century-old Wilson Red Line station began in October but the new station likely won’t be completed until 2017. Before construction on the station began, Ald. James Cappleman (46th) said the $203 million project was “a long time coming, a couple decades coming.” Residents should expect some street closures during demolition and construction. When complete, the station will serve as a new transfer point between Red and Purple lines. The project is part of a $1 billion initiative, the CTA’s Red Ahead program that hopes to modernize and maintain Chicago’s most-used “L” line.